Junk car buyers are more common now than ever before, and that is not surprising. Cars are valued most when they’re new and in excellent running condition, but even when they’re old and beyond repair you can still sell them to junk car services that are online. These companies offer a cash for cars incentive program wherein they’ll buy cars destined for the junk heap because some of those parts are still usable and can be sold. Check the General Condition of Your Car. If your car is 15 years or older and has logged at least 200,000 miles, it’s a good candidate for a vehicle junk buyer, but the amount you get also depends on the components of your car, more specifically the transmission and engine. The other parts like the interior, tires, trim and the exterior are also going to figure prominently in determining how much you will get for the car. Another way to get the most value from junk car buyers is to conduct a comparative study of similar cars and models. Make certain you’re comparing your car to a similar make and model and in the same relative condition. 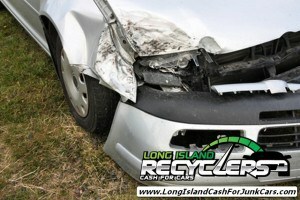 Once you have an idea of how much your car is worth you can start searching for junk car dealers and sell it. There was a time when your only resource for junk car buyers were the newspapers and the yellow pages, but now it’s easier to do research on the Internet and compare their services, price offers and features. There are generally two options available for you, a private individual or a dealer. Some prefer one over the other, but you are likely to find more dealers on the web. Not only are there more dealers, but they usually offer a free towing service so you don’t have to worry about how to get your car to them. All of these services offer a free quote, so use that to your advantage and get the maximum value. More importantly they’ll take care of the paperwork and documentation so you don’t have to worry about legalities concerning ownership transfer. Once you find a service that’s willing to buy your junk car for a fair price, it’s all a matter of waiting for the towing service to come and haul your car away. After that has been completed you’ll be paid. You might also be wondering if it’s better to do this yourself, that is, remove the car components and sell each one individually online. You can do that but it’s going to take a lot of time and effort, not to mention the fact that you could spend a long time waiting for a buyer. By selling to junk car buyers you’ll be assured of quick money and second, you don’t have to get your hands dirty in the process, so it’s more convenient and practical.